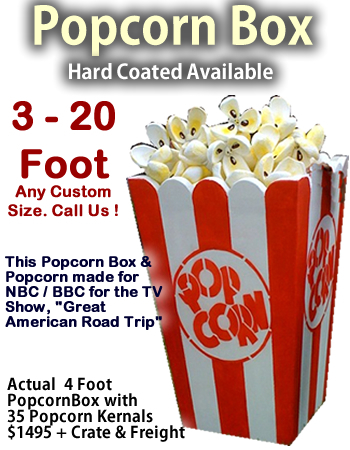 Giant/Big Popcorn Box and Kernels - Any Size - Dino Rentos Studios, INC. Call us for a quote to make your custom version! 4 foot popcorn box with 35 pocorn kernels (as shown - actual prop). In full 3D. Each popcorn kernel is seperate. Custom logo available. Get your prop hard coated to keep it protected during repated use.